CARMEL, Calif. – July 20, 2016 – The Automotive Fine Arts Society will welcome The Lincoln Motor Company as the sponsor of their 31st annual art show at the 2016 Pebble Beach Concours d’Elegance on Sunday, Aug. 21, from 9:00 a.m. to 4:30 p.m. in Pebble Beach, Calif. It will mark the 20th year Lincoln has sponsored the exhibit on the 18th fairway of Pebble Beach Golf Links. The art show will include automotive subjects in a variety of mediums including watercolors, acrylics, oils, wood and various metals. Lincoln will also sponsor the AFAS cocktail party on Saturday, Aug. 20, from 4:00 p.m. to 6:30 p.m. The AFAS pavilion will consist of a 6,700 sq. ft. exhibit area featuring the works of 23 fine artists, plus a 1,000 sq. ft. veranda overlooking the Concours field. On display will be two of Lincoln’s newest, highly-anticipated product offerings: The 2017 Lincoln MKZ Black Label and the 2017 Lincoln Continental. Lincoln annually commissions an AFAS member to create an official sponsor piece for the reception. 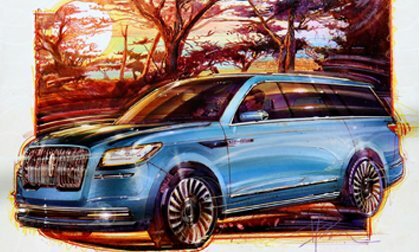 Artist Dennis Brown was chosen for 2016, and his piece, “2017 Lincoln Navigator Concept along the Coast,” was featured on Lincoln’s invitations to the party. Brown’s use of color and light shows the peaceful movement of a Sunday drive outlined by a vivid sunset through the trees. Reception attendees will be entered into a drawing to win the painting at the reception. Each year, an AFAS member wins the prestigious Lincoln Award for the most elegant artwork. It is one of the most coveted awards. The AFAS membership is a virtual “Who’s Who” in the world of automotive fine art. The group boasts 24 international painters and sculptors from across Europe and North America. Membership bestows a mantle of professionalism, quality and talent that is respected by critics worldwide. AFAS was established in 1983 by a group of artists who are acknowledged by critics to be among the best in their field. Members work in many diverse mediums including oil, watercolors, acrylics, wood, gouache, pen & ink, clay and metal. AFAS and its members participate in select shows across the country including the Pebble Beach Concours d´Elegance, Dana Point Concours d’Elegance and the Amelia Island Concours d´Elegance. Information about AFAS is available at www.autoartgallery.com or by contacting Scott Black at 214.520.3430.